How is everyone doing with their New Year’s Resolutions? I’ve been doing ok on a few of them like eating better and saving money. On others I’m a complete failure! I feel better knowing I’m not alone. Studies have shown that many people give up on their resolutions after the first week of January and only about 40% stick to their goals year-round. One important thing to note is that it doesn’t have to be a new year to make positive changes. You can start anytime of year and be successful. I’ve added a new resolution over the past couple weeks – to drink more water! I tend to drink more coffee than water and I’d like to put that in reverse. A new report from Brita shows that less than 50% of Canadians are actually drinking the recommended two to three litres of water per day. I know for a fact I wasn’t drinking that much. I’d have a glass here and there, but mostly it would be the never ending coffee cup that I was constantly downing. 74% of Canadians are more likely to choose a sugar sweetened beverage when thirsty because they are more readily available than healthier options. Over two billion sugary drinks are consumed annually in Canada. 78% of Canadians feel they should be drinking more water than they typically do. 37% of Canadians say they do not drink enough water because they do not like the taste of tap water and are concerned about purity levels. 91% of Canadians feel that obesity is more of a problem today in Canada than it was five years ago. As I was reading the stats from the report, I found myself nodding my head in agreement for most of the items. I know I should be drinking more water. I dislike the taste of our city tap water with its strong chemical taste. I rarely drink pop or juice anymore, but I drink coffee way more than I drink water. When Brita emailed me with a challenge to drink the recommended 8-12 glasses of water a day, I eagerly accepted. This was the push I needed to get into the habit of drinking more water and improving my health. So far so good! I’m doing 100x better than I was just a month ago. I’ve got this. I wanted to share what I’ve been doing with these 10 easy ways to drink more water. 1. Drink great tasting water. If it doesn’t taste good, it will be harder to drink! 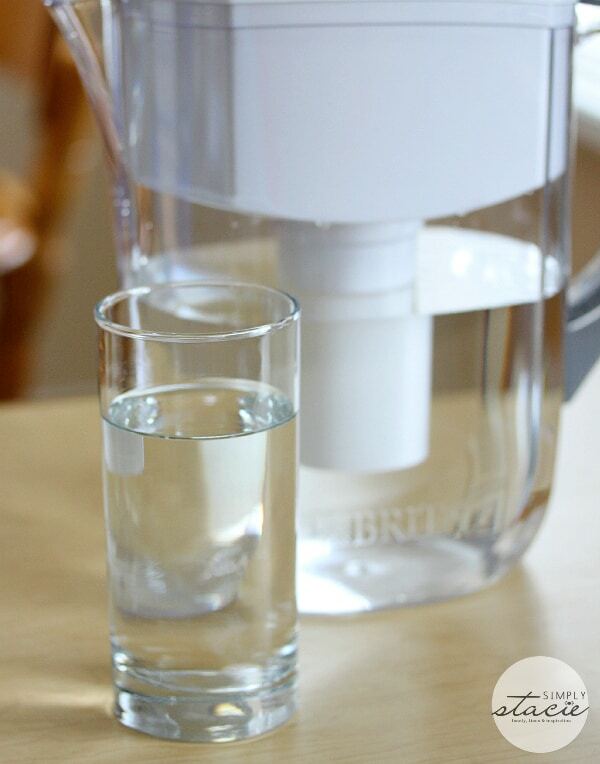 I’ve been solely using my Brita Water Filtration System to drink water at home. Water tastes so much better and it reminds me a little of drinking my favourite bottled water. The taste is crisp, cold and clean – exactly the way I love my water. It reduces chemicals like copper, mercury, cadmium, chlorine and zinc that may be found in tap water. 2. Bring water with you when you leave the house. 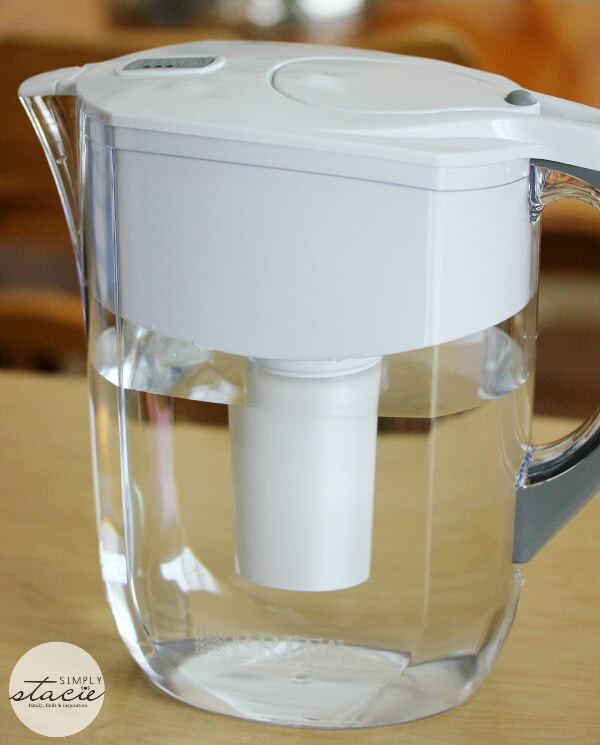 Since it’s not quite feasible to bring the Brita Water Pitcher with me when I’m heading out, I bring the next best thing: the Brita Bottle Water Filtration System. 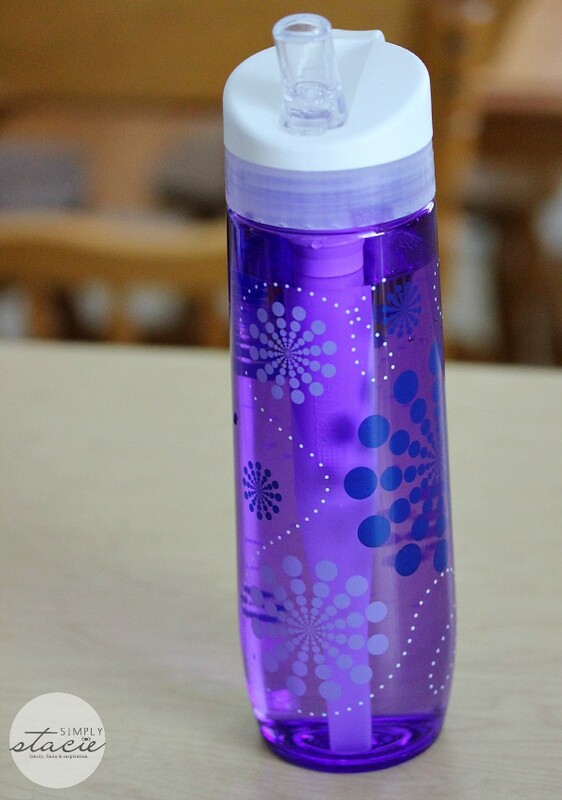 It’s basically a water bottle with a built in filter to give you great tasting water no matter where you go. 3. Add some flavour to your water. I like to add lemon essential oil to my water to change it up. You can also add lemon slices, cucumbers, mint leaves and lots more. 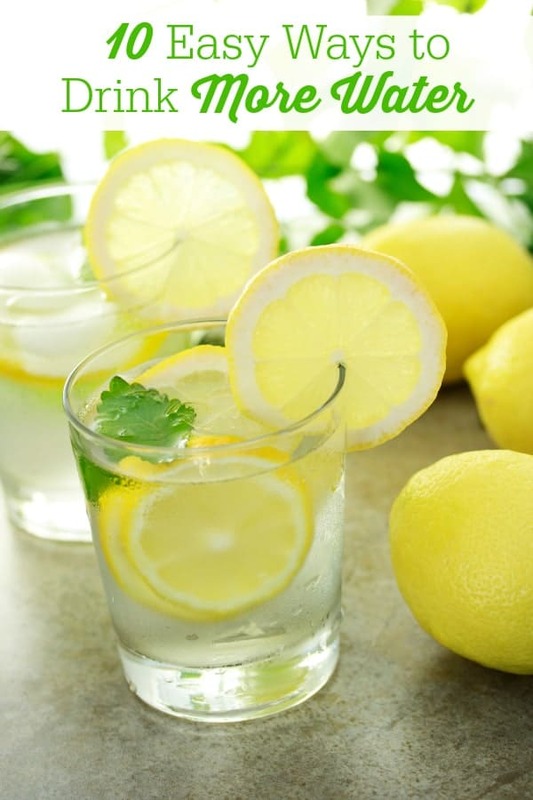 This blog features 68 ways to naturally flavour your water if you need some inspiration. 4. Keep a full glass of water with you at all times. This another good habit I’m getting into. I always make sure I have a full glass with me whether I’m working, cleaning the house, reading, or watching TV. When I finish off the glass, I refill it right away instead of leaving it sit on the counter. 5. When cravings hit, drink water. Hunger can sometimes be caused by dehydration. When I’m having a serious sweet craving, I drink water and then wait about 10 to 20 minutes. Usually by then, the craving will have passed and I won’t have ruined my diet by eating something I shouldn’t have. 6. Start your day with a glass of water. I’m getting into the routine of drinking a glass of water before my morning coffee! I think this is the hardest habit of all to break because I’m so used to drinking only coffee in the morning! 7. Track your water intake. I’m an organized person with my spreadsheets and lists and I discovered a smartphone app for keeping track of your daily water intake! I’m using Waterlogged on iOS. 8. Drink water between coffee or other sweet beverages. I’m not giving up my coffee, but instead of reaching for mug after mug, I’m breaking it up with water. I’ll have a glass of water between coffees. It forces me to drink more because I love my coffee! 9. Drink water with meals. My aunt swears this has helped her stay slim and trim. She drinks lemon water with every meal. 10. Use a straw. I only drank with a straw at restaurants because it seemed a bit juvenile to me to do at home. However, you really do drink more with a straw! It works. The first few days I was running to the bathroom a lot until my body adjusted to the increased water intake. I’m feeling amazing so far! I’m looking forward to reaping the health and beauty benefits that drinking more water brings. It was easier than I thought it would be to do and this is one resolution that I plan to keep! I drink about 150 oz a day. Not enough. I only drink 2-3 glasses of water. I usually drink 3 or 4 bottles a day. Honestly I don’t typically drink water and that’s bad. I tend to only drink Coke, and that’s bad. I was contemplating getting a brita but that would only solve half my problem, I also need an ice maker because I only like it ice cold. Currently I am drinking between 500 and 1000 mL per day. When I get back on track it will be up to 2500 mL.